November 11, 2018 Hearthstone player count is now over 100 million. Hearthstone player count continues to grow years after its release, and the latest number is an especially notable milestone: 100 million players. Blizzard announced that number earlier today, and the company’s giving out gifts in celebration – namely, six free card packs from the most recent expansion, The Boomsday Project. You’ll get those free packs if you log in any time from November 7 at 10:00 PST / 13:00 EST / 18:00 GMT through November 11. You’ll also get a Celebrate the Players quests, which gives you 100 gold for playing a friendly challenge and is repeatable up to five times. Just make sure you’ve got room in your quest log for the new challenge. Hearthstone launched in 2014, and gathering 100 million players in that time is no small feat, even if it’s aided by free-to-play pricing and a popular mobile edition. The growth of the game hasn’t slowed down, either. Blizzard reported 70 million players halfway through 2017, so 30 million new players in about a year and a half suggests that the game isn’t slowing down. 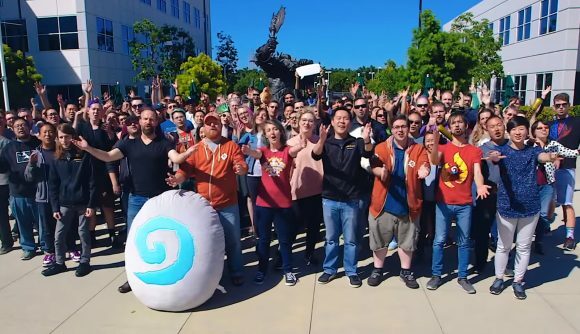 Blizzard also provided an adorable video with the announcement featuring the Hearthstone devs saying their thank yous to the community. Hearthstone is in an odd place now that director Ben Brode has departed Blizzard for Second Dinner. So far, it doesn’t seem to have slowed down the prolific card game at all, but the real test will come with Rastakhan’s Rumble. The new expansion launches in December, and will provide the next step toward Hearthstone’s future. Look forward to checking in with Blizzard on the next player count milestone, whenever that comes.